or being the location of many artists’ lofts and art galleries, but is now better known for its variety of shops ranging from trendy upscale boutiques to national and international chain store outlets. The area’s history is an archetypal example of inner-city regeneration and gentrification, encompassing socioeconomic, cultural, political, and architectural developments. The name “SoHo” refers to the area being “South of Houston Street”, and was also a reference to Soho, an area in London’s West End. It was coined by Chester Rapkin, an urban planner and author of The South Houston Industrial Area study, also known as the “Rapkin Report”. 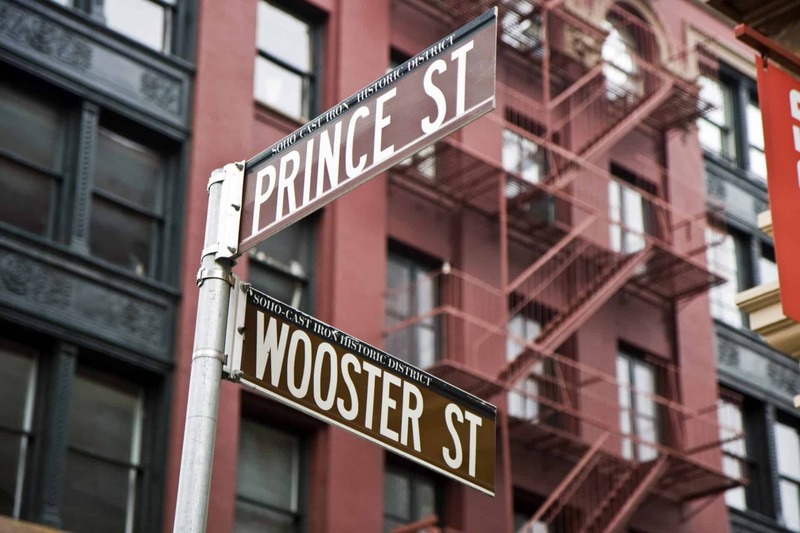 This began a naming convention that became a model for the names of emerging and re-purposed neighborhoods in New York such as TriBeCa for “Triangle Below Canal Street”, DUMBO (“Down Under the Manhattan Bridge Overpass”), NoHo (“North of Houston Street”), NoLIta(“North of Little Italy”) and NoMad (“North of Madison Square”), among others. 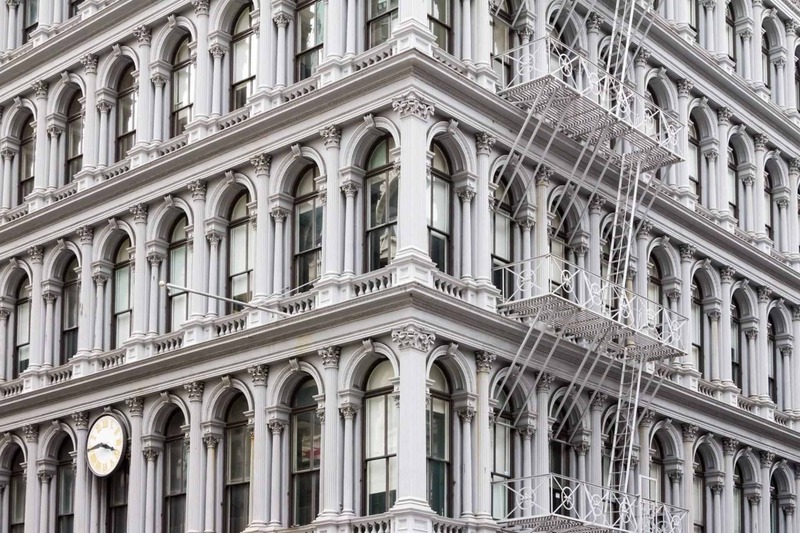 Almost all of SoHo is included in the SoHo–Cast Iron Historic District, which was designated by the New York City Landmarks Preservation Commission in 1973, extended in 2010, and was listed on the National Register of Historic Places and declared a National Historic Landmark in 1978. 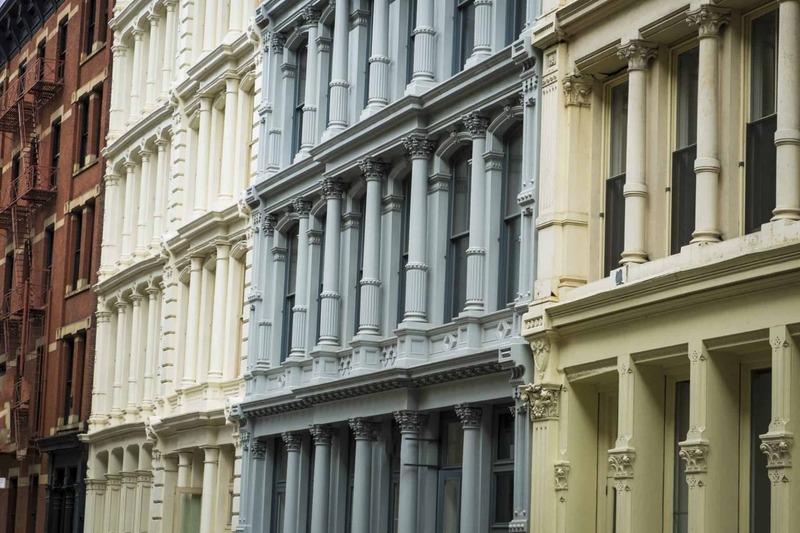 It consists of 26 blocks and approximately 500 buildings, many of them incorporating cast-iron architectural elements. 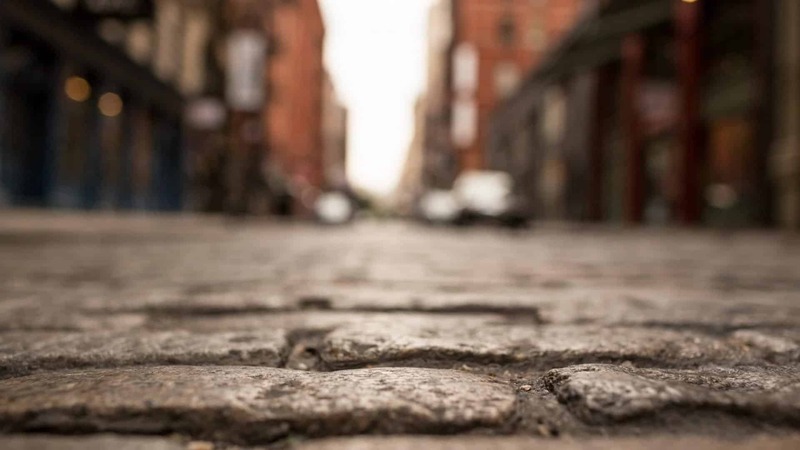 Many side streets in the district are paved with Belgian blocks. 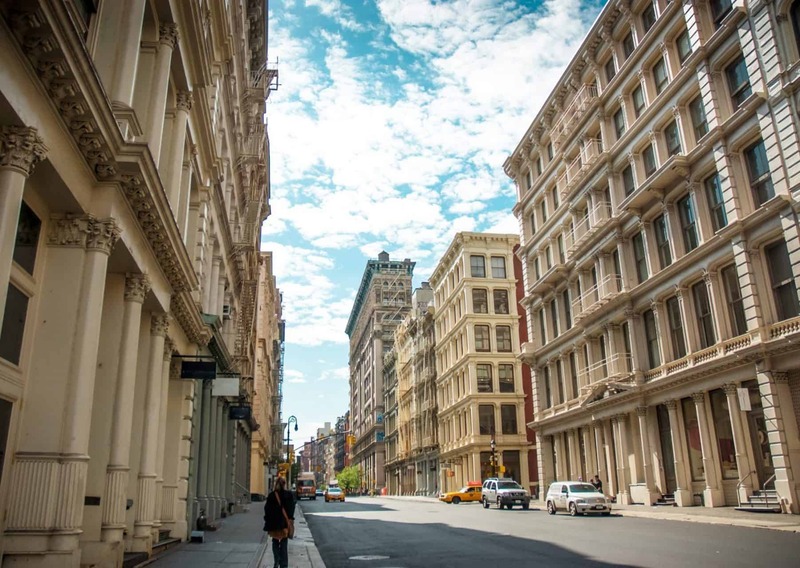 Hudson Square is often called SoHo but it is actually its own distinct neighborhood. Canal Street to the south, Varick Street to the east and the Hudson River to the west. To the north of the neighborhood is Greenwich Village, to the south is TriBeCa, and to the east is SoHo. The area once was known as the Printing District, and into the 21st century it remains a center of media-related activity, including in advertising, design, communications, and the arts. Within the neighborhood is the landmarked Charlton–King–Vandam Historic District, which contains the largest concentration of Federalist and Greek Revival style row houses built during the first half of the 19th century. The most prominent feature within the neighborhood is the Manhattan entrance to the Holland Tunnel. The tallest structure in the neighborhood is the Dominick condo hotel. If you’re thinking of buying in SoHo, our foremost goal is to provide you with exceptional customer service. Our goals are to help you purchase the right home, make sure you don’t miss out on any homes that meet your needs and make sure you don’t pay too much for your next home. Please utilize our New York real estate expertise to make your home search and buying experience as stress-free and rewarding as possible. We utilize the latest, cutting-edge, real estate marketing tools to expose your SoHo property to the widest range of potential buyers. We are here to get your house aggressively marketed to sell as quickly as possible and for the best price! 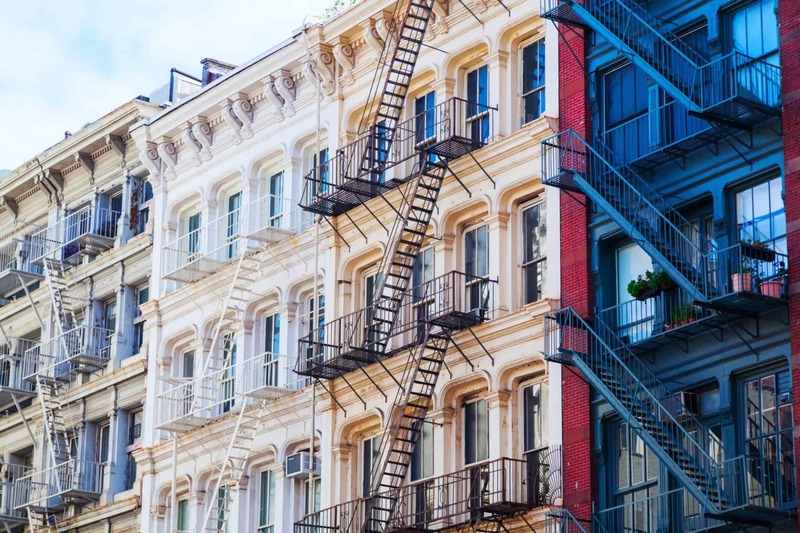 Our goals are to help you get your SoHo home sold, put you in the strongest negotiating position as possible, and to make it easier for you and reduce surprises.